An enterprising restaurant in New York has developed a farm to table garden on the dormant construction lot next to their location. 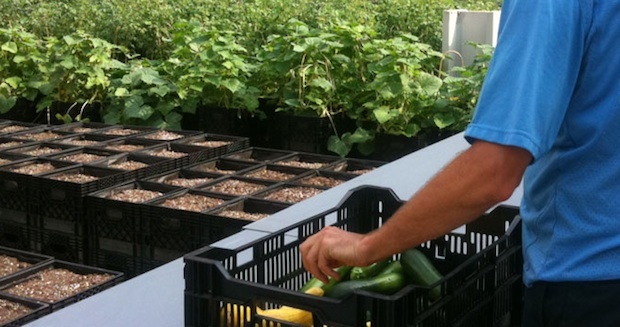 According to a Fast Company article, "The farm now contains 7,400 milk crates and over 100 types of plants. Riverpark currently gets about 25% of its produce from the farm, but expects to get more soon." It's a ingenious design created out of the necessity of not being able to dump large amounts of garden soil on the temporary site they had secured. Ortuzar and Zurofsky presented their quandary to ORE Design and Technology Group, which proposed the milk crate idea: Staple a piece of landscaper fabric (a material that allows air and water to pass through) to each milk crate, and fill it with soil. There is now truly no excuse for not growing some of your own food. All you need is a milk crate, a piece of landscape fabric, and a litle dirt. I love it. Now all we need is a design for a milk crate chicken coop.